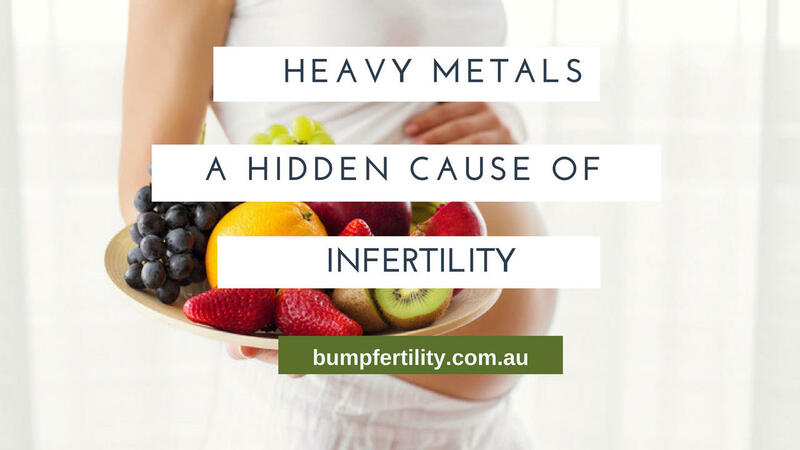 Heavy metals and toxicity are in the top 10 fertility factors causing troubles getting pregnant either naturally or with IVF. This is why the BUMP®Fertility method utilizes the most up to date natural fertility screening techniques based on peer review research and modern science. There is a complex connection between heavy metals, Polycystic Ovarian Disorder (PCOS), endometriosis and unexplained infertility. Heavy metals and toxic accumulation of cadmium, mercury, nickel, lead, and copper can interfere with the production or action of key fertility hormones such as estrogen, progesterone FSH, and LH. What most people don't realize is you don’t need to work in an industrial environment to be exposed to heavy metals, they are far more commonly present that you’d think; and if your body has trouble eliminating them, they can easily accumulate and interfere with your hormones and contribute to PCOS, endometriosis and other reproductive disorders linked to unexplained infertility. Mercury is a nasty heavy metal that many people are exposed to through amalgam dental fillings. Women with between 4 -10 amalgam dental fillings, were estimated to uptake 8 - 30 mcg mercury daily through their saliva. However, women with over 10 fillings were estimated to uptake 163 mcg (4,6), with this amount more than double if they were chewing (for instance on gum). To put this in perspective, the World Health Organisation puts the upper limit at only 1 mcg per day (4). Other research found women with PCOS had significantly higher levels of mercury than women without PCOS. This may be a link that needs further research and could potentially be because mercury lowers progesterone levels but increases estrogen (4,6), impairs ovulation and lowers thyroid function (4,6) – which are all causes for PCOS and infertility. Copper levels are significantly higher in women with PCOS than without (1,2). A main source of copper is drinking water traveling through copper pipes or that has had copper added to it – copper can be added to water reservoirs to reduce algae growth. The Oral Contraceptive Pill and a copper IUD can also contribute to higher copper levels (7). Copper has an affinity for estrogen: when one rises, so does the other; but it also is an antagonist for zinc which as an affinity for progesterone. This means that high copper levels increase estrogen but decrease progesterone levels and also impairs thyroid function. All of these factors influence female fertility either through their influence on egg quality and quantity, through to ovulation and implantation. In addition, the evidence clearly illustrates the connection between copper, PCOS, and unexplained female infertility. The heavy metal lead was commonly used in house paint until the 1970’s. An estimated 30-50% of the population lives in houses built before then. If you belong to this group, you are at greater risk of inhaling small paint chips containing lead, and this can lead to lead toxicity. Other sources include soil contaminated with sediment of industrial or car exhausts, especially in densely populated areas. Water pipes were once made of lead and many of these are still in use. The lead from these can leak into drinking water and contribute to high levels of lead exposure and toxicity. Finally, cosmetics and beauty products can also contain lead, so always aim for lead-free (8). Lead has several influences on female hormones, primarily it's ability to inhibit progesterone and impair prolactin production, resulting in irregular periods (4,5,6). Low levels of lead increase the production of estrogen, testosterone, and cortisol, but high levels inhibit them (5). These imbalances can all lead to irregular ovulation and menstrual periods and may be factors contributing to unexplained infertility. Interestingly, one study showed that intrauterine exposure (exposure in the mother’s womb) caused irregular cycles and infertility of the offspring (4). This means you may have inherited lead toxicity from your mother, and that you can pass it on to your children. Cadmium is found in pesticides and in non-organic animal products. The nasty thing about cadmium is that one of the places it is stored is in the pituitary gland – the master gland that signals hormones to be released from your thyroid, adrenals, and ovaries. Even low-level exposure to cadmium can interfere with hormone production, while it can take up to 20 years before it is completely metabolized (4,5). This means you only need to be exposed to a small amount of cadmium for it to have long-lasting consequences. Cadmium can affect thyroid function and interrupt signals to the ovaries. It is also linked to low progesterone and prolactin levels but more potent androgens (3-5). It potentially plays a role in PCOS because of this. Cadmium levels were found to be elevated in women with endometriosis, uterine fibroids and those who had miscarriages (3-5). It has also been shown to increase the number of NK (Natural Killer) immune cells. NK cells need to be low during pregnancy to allow for a baby to grow in the mother’s body; if they are high this can cause recurrent miscarriages (6). Nickel is found everywhere: in the air, soil, and foods. Margarine is one of the foods highest in nickel because nickel is used in the process that solidifies the fat. Tea is also high in nickel – high nickel levels are often food in people who drink large amounts of tea (8). A study published this year showed that women with endometriosis had significantly higher levels of nickel than others: 2.6 mcg/L compared to 0.8 mcg/L (3). This is possible because nickel acts as an estrogen (3) and creates an estrogen-dominant environment. It is noteworthy that these levels are still deemed to be non-toxic (3). Nickel also decreases iodine uptake by the thyroid, inhibits the release of prolactin and growth hormone, and can induce insulin resistance (5). It has the potential to play a role in PCOS this way. How can you measure your heavy metal load? Heavy metals are quickly deposited in body tissues. Therefore blood tests are poor indicators for the heavy metal load (4). Urinary excretion tests give an indication of how much is eliminated through urine, but if your body is not yet excreting it but keeping it in storage it still isn’t a good indicator. Urine tests are useful once you have started a monitored heavy metal detoxification program. The best way to assess storage levels is through a Hair Tissue Mineral Analysis – provided you haven’t colored or dyed your hair in the last 12 weeks. Otherwise, nail clippings can also give a reliable reading. If tests show that you have elevated levels of heavy metals, the next step is to plan elimination carefully. Various studies have shown that the toxic effects of heavy metals can be reduced by taking zinc, calcium or vitamin C (6). However, at BUMP Fertility I recommend a professional integrated detox approach. Firstly because taking one mineral to counteract another can create imbalances amongst other minerals and do more harm than good; and secondly because once mobilized from their storage, the heavy metals become more toxic. You need a practitioner who is trained in this area to guide you safely through this process. How can I confirm I have Heavy Metals? One of the most reliable ways to determine whether heavy metals may be causing your symptoms is to keep a diary of symptoms. Common symptoms of heavy metal toxicity include irregular ovulation, Premature Ovarian Failure, failed IVF cycles, poor egg or sperm quality, recurrent miscarriage and many more. In addition, several tests are available to help confirm a heavy metal diagnosis. BUMP offers both a Pre and Post chelation metal test. A challenge test is a means of comparing the respective quantities of heavy metals in two urine samples. The first sample is normally taken from an early morning specimen (Pre-chelation), whilst the second is sampled from a subsequent 24hr urine collection following the administration of a chelating agent (Post-chelation). From this we can compare the excretion patterns before and after administration of the chelating agent, thereby obtaining vital information as to the propensity of the body to store heavy metals. It is recommended that the PRE chelation and POST chelation are ordered together.